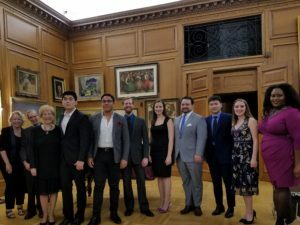 On the evening of Friday, November 3rd, The Gerda Lissner Foundation in Association with The Liederkranz Foundation presented its Lieder/Song Vocal Competition Winners Concert of 2017. It showcased its retinue of young and talented singers which allowed the distinguished and discerning audience an opportunity that was both enticing and gratifying. 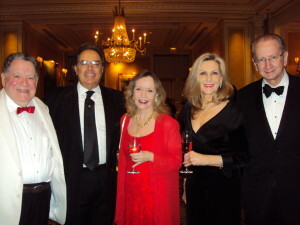 The presence of Stephen De Maio, industrious President of the Gerda Lissner Foundation, with Michael Fornabaio, the formidable Vice President and Treasurer, Cornelia Beigel, the effervescent and valued Secretary and Trustee, Karl Michaelis vibrant and urbane Trustee, and soprano, the devoted Barbara Ann Testa, treasured Trustee and chic auditions announcer Joyce Greenberg added to this esteemed and cordial group of Lissnerites! 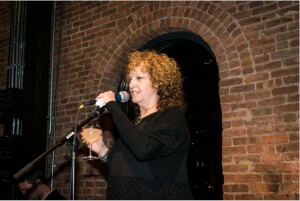 President Stephen De Maio introduced our hostess for the evening by just mentioning her illustrious places of employment: WQXR radio and PBS Channel 13 where her eager speaking voice, love of music and personal charm have made her name synonymous with all things good for the soul and spirit. Midge Woolsey mentioned that madness was the recurring theme of the evening (like Sir Noël Coward’s song Mad About the Boy). Love madness dominated the performance. She also thanked her beaming economist husband, Dr. Juergen “Jerry” Stolt for perfecting her German in the proceedings. She then introduced the piano accompanist, Arlene Shrut and singled out this gifted accompanist as an artist whose versatility and passion for 25 years are a source of veneration and inspiration. 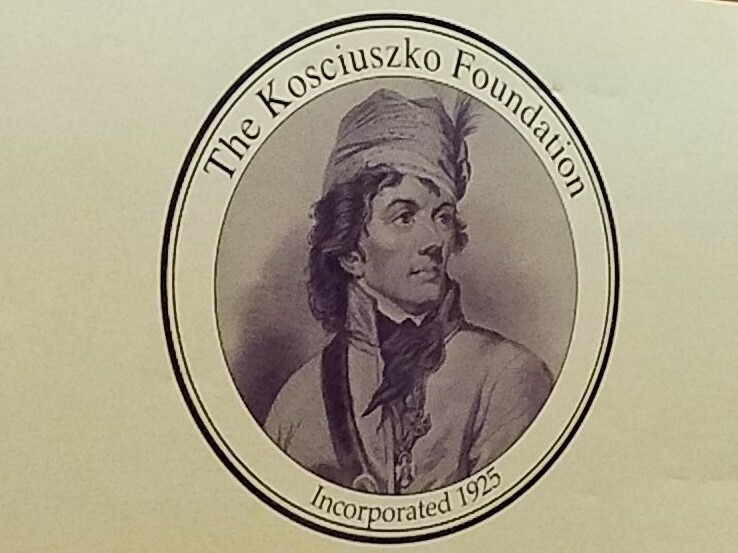 In the elegant auditorium of The Kosciuszko Foundation on East 65th Street in New York City, the concert began. We saw the great soprano Metropolitan Opera legend Elinor Ross, the extraordinary pioneer conductor Eve Queler, the radiant Gloria Gari from the Giulio Gari Foundation and the suave Glenn Morton from Classic Lyric Arts, whose evening the night before with his Italian and French trained singers, also gave a happy look toward the future of opera. It was nice to greet music lover Mario Cesar Romero who seemed to be quite happy with the prospects of this special evening. The concert began with Brian Vu, baritone who sang “Le manoir de Rosemonde” by Henri Duparc. Duparc who passed away at age 37 had many moments of madness both medical and musical. Brian Vu sang with passion, his high baritone on the threshold of heaven leading us on a quest that reaches the door. A brief journey made plangent and pleasant by this fine newcomer! Baritone Justin Austin sang “Chanson èpique” from Don Quichotte a Dulcinee by Maurice Ravel.The great Russian basso Feodor Chaliapin sang in the 1930’s film with music by Jacques Ibert since Ravel’s music was not entirely used. Mr. Austin sang with expression and strong lyrical thrust. This prayer to St. Michael and St. George had the outburst of the heart that makes one whole, a subtle and intimate revelation. Bass baritone Nathan Milholin sang “Die Mainacht” by Johannes Brahms. This expanding, increasing and unceasing run of terror made for heart grasping nightmarish fears! Mr. Milholin’s summation was unforgettable. His powerful declamations were truly chilling. 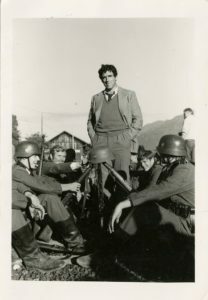 His utterances of “Mein Fatha” were indelible. Emile Pogorelc sang “Wasserrose” by Richard Strauss. Ms. Pogorelc has a truly lovely soprano that carries strong and well. Richard Strauss wrote this “intimate” piece with some magical high notes, yet draws one in by its singular emotion. Ms. Pogorelc’s versatile and expressive singing was compelling and unifying. Next was Leo Radosavljevic, bass baritone in “Fühlt meine Seele” by Hugo Wolf. An impassioned, all out selection in caressing tone, fine diction and many moments of the voice and piano being passionately united in urgency, conviction and harmony. Baritone Jacob Scharfman sang “Nachts” by Erich Wolfgang Korngold, proving himself to be a captivating performer of great concentration. He is an architect of sound and builds a song very effectively, each vocal brick properly paced and placed. His baritone is warm and strong and it won’t be long before his “song” takes him far and wide in the universe of singing! John Chong Yoon Noh had the unique standing of being the only tenor of the evening. He sang “Heimliche Aufforderung” by Richard Strauss in a fervent and inspired interpretation. Noh has a fine, embracing tenor that has a special quality and warmth. Soprano Alexandra Nowakowski sang “Villanelle” by Eva Dell’Acqua. Midge Woolsey told the audience how much she admired the recording by Beverly Sills as a youngster, but had never, until now, actually heard it sung “live.” I think Madama Marcella Sembrich would also have admired the magical way it was sung that night. Ms. Nowakowski, a 2014 Marcella Sembrich award winner, sang with high angelic lovely scales, an instrument fueled by Sembrich and Sills. We got “high on highs” and were heaven bound. Marcella Sembrich’s charming house and museum in Bolton Landing is on the banks of Lake George in upstate New York. Bass William Guanbo Su sang” Erlkönig” by Franz Schubert, in a bass that was both intimate and cavernous. He was the first prize winner but knew that his prize was easily shared by this illustrious group of fine, promising young artists, all of whom radiated charm and talent. We then all went to the delicious reception where we partook in some splendid “finger food” and delicious wines and pastries managed by the ingenious Philipp Haberbauer. It was great to vocally spar with basso Gary Kendall, find a comfy table and chat with Alfred Palladino from the Columbus Citizens Foundation, greet Met mezzo soprano Jane Shaulis, Joseph Gasperec and Janet Stovin from Opera Index, opera manger Ken Benson, Jane Marsh from the Opera Guild, vibrant patron Betty Cooper Wallerstein, Father John Kamas, pastor of St. Jean Baptiste Church and event manager Iwona Juszczyk from The Kosciuszko Foundation. 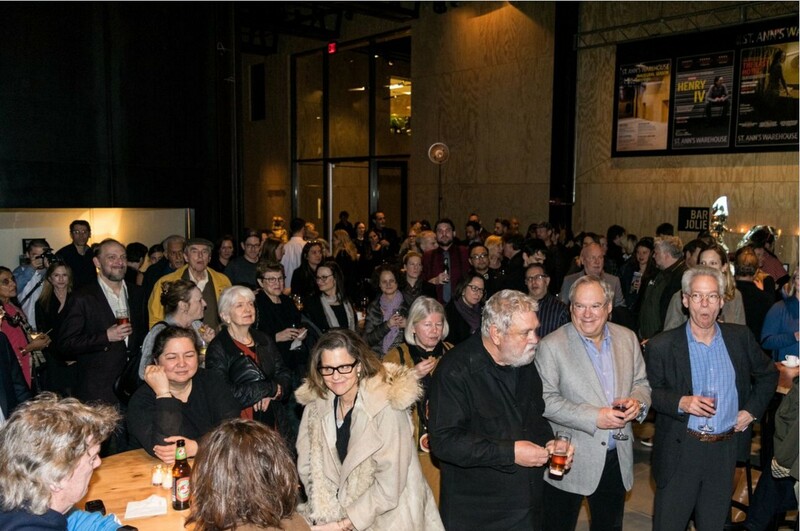 Here’s to the “same time next year!” Thank you President Stephen De Maio, The Gerda Lissner Foundation and The Liederkranz Foundation for a feast for the palate and the ears showing the good that still remains to uplift and inspire. 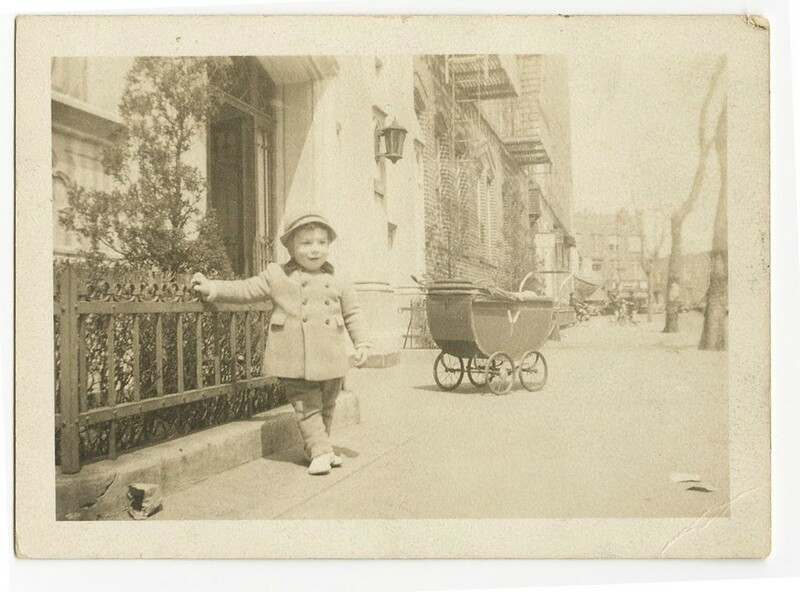 Marie Cantoni was born in November 1930 in Brooklyn, at home, on 75th Street between 11th and 12th Avenues, the youngest of four children. She passed away on Saturday, October 28th at the age of 86 in Brooklyn. Marie was introduced to opera by her maternal grandfather Giuseppe Ulla who was from Piemonte and who sang tenor in a church choir. 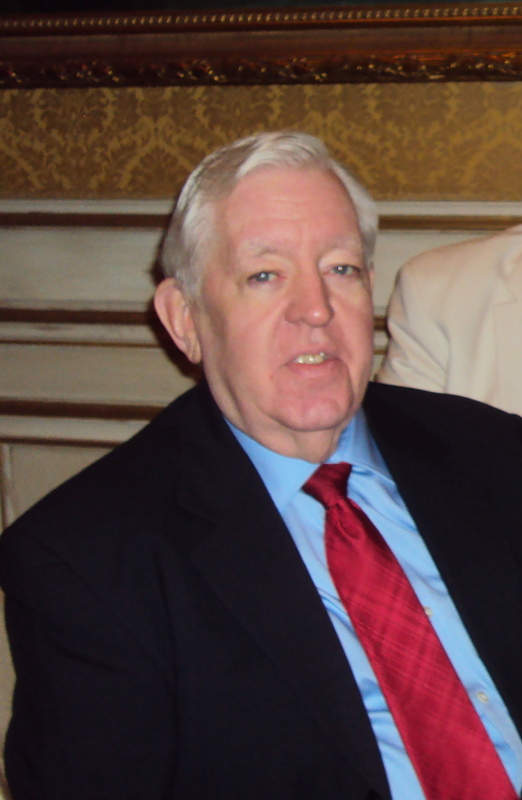 He loved the Metropolitan Opera broadcasts, which began in 1931 and would listen to them with his grandchildren. 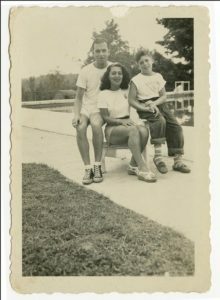 Marie attended P.S.176 and New Utrecht High School and became a legal secretary for a large admiralty law firm. 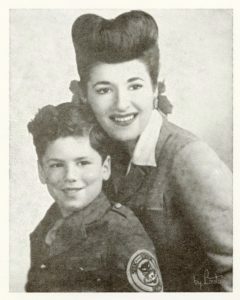 In 1957 she married Matthew Cantoni whom she had met in first grade. 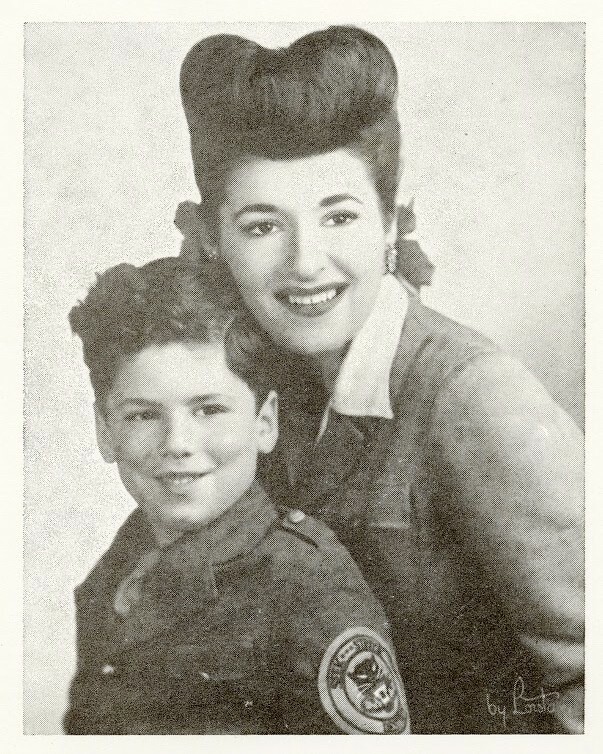 She quit her job and gave birth to Linda in 1958 and Mark in 1960. In 1970, she started the Regina Opera with a neighbor Nick Tierno, whose brother was a fine tenor with no place to sing opera. The company originally gave little concerts with piano accompaniment at the Regina Pacis Youth Center. Many of the original singers were members of the Regina Pacis choir. The first full opera was La Traviata in 1971. 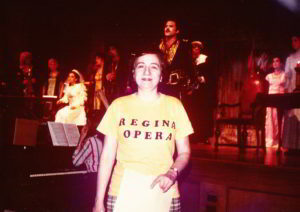 Judy and I, as Guild members, have been attending operas at the Regina Opera for 40 years with a large group of friends. We look forward with great enthusiasm to the works in this new season, including La Traviata, Madama Butterfly and their first Aida. Their 30 to 40 piece orchestra of splendid musicians are superb. The Regina Chorus is especially noteworthy. Thomas Vilardo, former Met Opera baritone mentioned that Met Opera soprano Licia Albanese visited and the late basso Don Yule from New York City Opera attended many times and superbly sang Sparafucile from Verdi’s Rigoletto at the Regina Opera. Today’s Met opera super mezzo Dolora Zajick sang Santuzza in Cavalleria Rusticana at the Regina Opera early in her career as did baritone Mark Delavan who was an outstanding Danilo in The Merry Widow. Soubrette soprano Elaine Malbin visited this exciting company. Many of the Regina Opera stars had large followings and that still prevails today! They all followed the standard of talent and graciousness set by Marie Cantoni. Whenever I embraced Marie upon greeting her, I felt I was in the presence of sweetness and the stuff of dreams. I am so confident that President Fran Garber-Cohen, Executive Vice President Linda Cantoni, Stage director, Linda Lehr, Maestros Alex Guzman and Gregory Ortega, Treasurer Joe Delfausse and all of the volunteers and staff will continue everything Marie started with a combination of Brooklyn grit and heavenly dreams. State Senator Marty Golden honored Marie Cantoni in Bay Ridge some years ago and we think she felt the love and appreciation of that sold out and wonderful event! We will all miss her very much but her indomitable spirit will soar with every note in the future. Whether it be La Bohème, Tosca or Aida, the tears will be half for the opera and the rest for Marie Cantoni whose passing leaves us with great sadness. She was a pioneer, a creator and a great Brooklynite. We all stand and shout “bravissimo Marie.” May you, dear and wonderful soul, rest in peace! 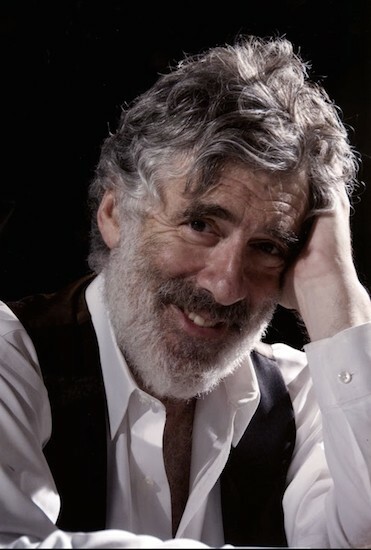 For Brooklyn-born Jewish men of a certain age, there are three totemic heroes: Sandy Koufax, Woody Allen and Elliott Gould. One of these giants (ah, poor choice of noun to describe a Brooklynite; let’s make that “titans”) afforded me the rare pleasure, and privilege, of hanging out with him on a recent trip to Los Angeles. 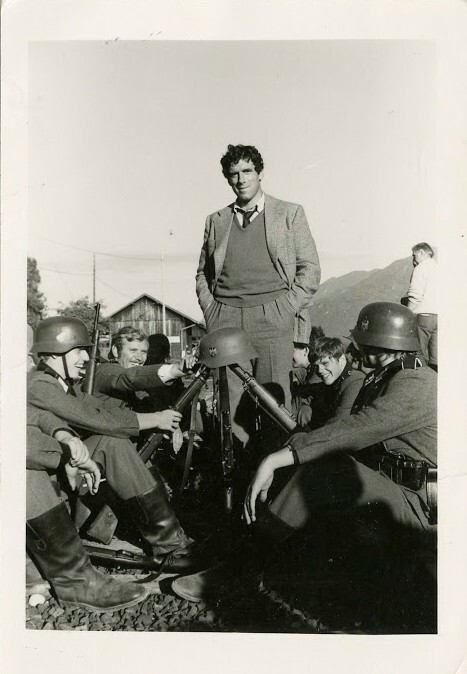 To say I “interviewed” Elliott Gould does not begin to do justice to the experience. A hunch I’d had for 45-plus years, ever since seeing him in “Bob & Carol & Ted & Alice,” turned out to be true: Gould is not only a prodigiously gifted actor, but he’s also a warm, wise, soulful mensch. Think Buddha meets Isaac Bashevis Singer or Kwai Chang Caine meets Rebbe Mendel. Not to mention God (or at least, his voice) in the 2007 version of “The Ten Commandments.” Not to mention all the television work, going back to 1964, when he played the Court Jester (and sang “Very Soft Shoes”) opposite Carol Burnett in “Once Upon a Mattress.” Not to mention 26 episodes of “ER,” where he played Dr. Howard Sheinfeld. Not to mention 20 episodes of “Friends,” where he played Courteney Cox’s (Monica’s) and David Schwimmer’s (Ross’) father, Jack Geller. Not to mention 17 episodes of “Ray Donovan,” as Ezra Goodman. Perhaps most especially, his membership in the elite Five Timers Club, having hosted “Saturday Night Live” six times. Altogether, over an almost 60-year career, Elliott has appeared in, by my rough calculation, 200 movies and television shows. From rabbis to casino owners, from lawyers to gangsters (not that big a stretch, actually), Elliott has played them all. He is the indisputable heir to throne of James Brown, as the hardest-working man in show business. Born Elliott Goldstein on Aug. 29, 1938 in Bensonhurst, it can be argued that he was the first undeniably Jewish leading male actor in Hollywood. Unlike, say, Kirk Douglas or John Garfield, who, while themselves Jewish, usually played generic roles (with the notable exception of Garfield’s “Dave Goldman” in “Gentlemen’s Agreement”) Elliott always was, and is, unabashedly Jewish. Before we begin the interview, Elliott gives me a tour of his art- and memento-filled apartment: photos of his and Barbra’s [Streisand] son Jason, paintings and drawings done by Jason and by Elliott’s granddaughter Daisy, three Hirschfield caricatures (Elliott and Marcia Rodd in Jules Feiffer’s “Little Murders”; Elliott with James Caan, Diane Keaton and Michael Caine in Mark Rydell’s “Harry and Walter Go to New York”; and Elliott with Sterling Hayden and Nina van Pallandt in Robert Altman’s “The Long Goodbye.”) There is also an image that makes my hair stand on end: a numbered lithograph of World War I refugees by the French artist Theodore Steinlen. What makes my follicles stand at attention is the fact that I grew up with the exact same image (a different numbered edition) hanging on my Brooklyn bedroom wall. After making sure I was comfortable (“You can sit anywhere you want”) and didn’t want something to nosh on (“I have some fresh apples”), we got down to the principal reason for my visit: Elliott’s strong attachment to Brooklyn. As I was to learn over the next two-and-a-half hours, he possesses a photographic memory. The Eagle: Where did your family live in Brooklyn? EG: 6801 Bay Parkway, Brooklyn 4. 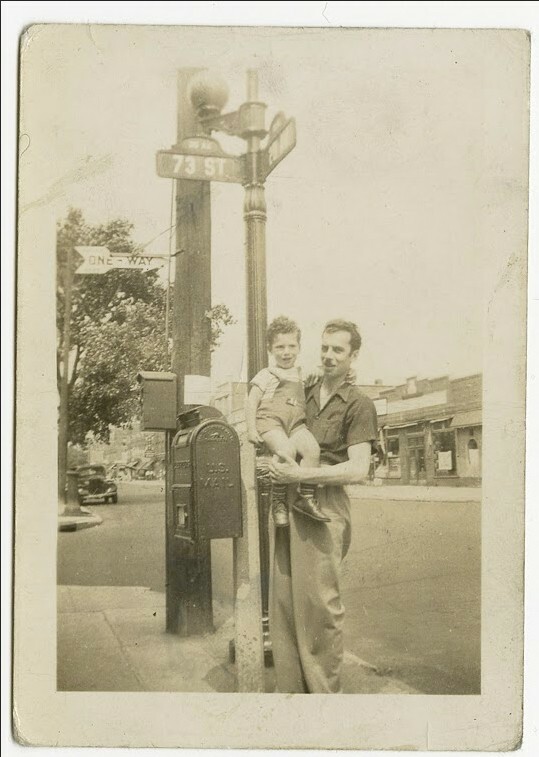 N.Y. (West Ninth Street, between Bay Parkway and Avenue O.) Our telephone number was Beachview 2-5524. I went to grammar school at P.S. 247, which was three blocks away from our apartment. One of my earliest memories was the day I found my balance and could take my first steps. 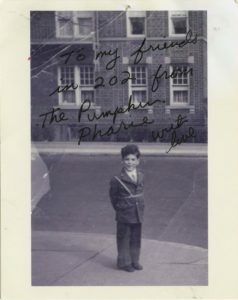 I was a bit worried, as kids are, because my friends Stevie Greenstein and Ed Posner had learned to walk before I did. 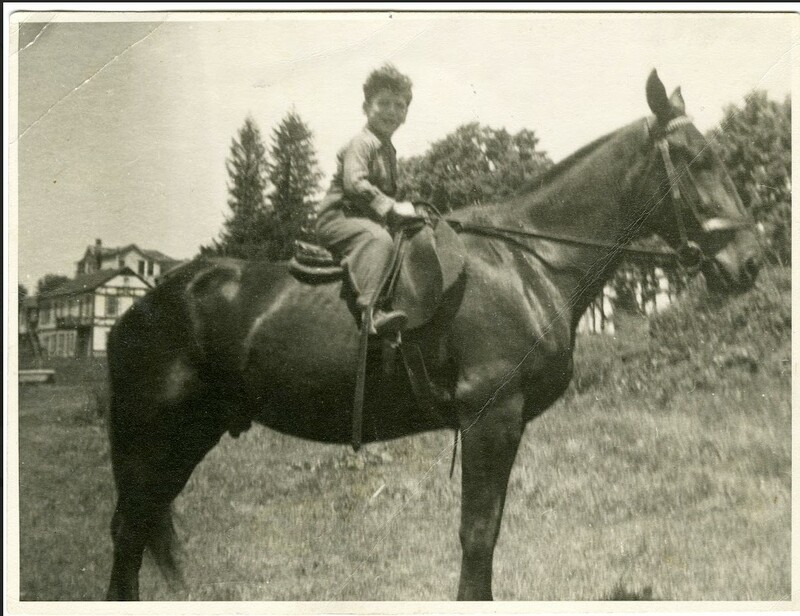 My mother reassured me, “Ah, don’t worry about it, you’ll catch up to them.” My mother was a very practical woman. She was a milliner; she made hats for all the other women in the neighborhood. 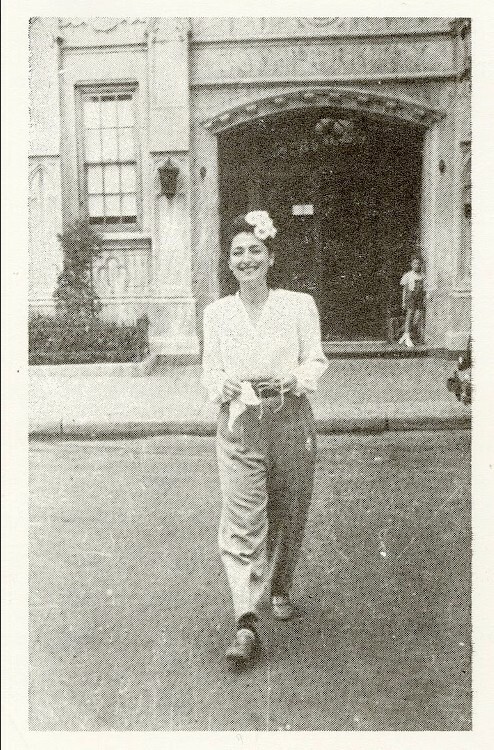 She also was very fashionable — and beautiful. Elliott goes to his mammoth desk, which is cluttered with scripts, books and tchotchkes. 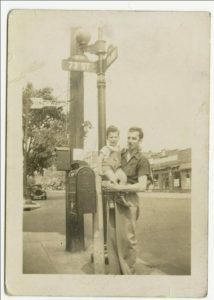 He extracts a 5-foot-by-5-foot memorial card with a photograph of a striking, stylish woman — circa mid-1940s — wearing a white blouse, billowing slacks and a white gardenia in her hair. 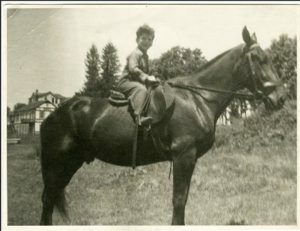 Inside the card are the words “Lucy Gould, July 27, 1915 – September 24, 1998. 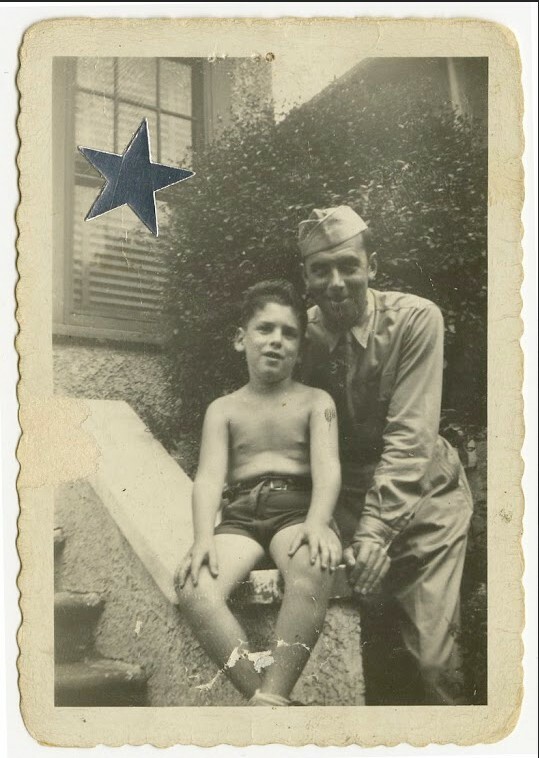 In loving memory and devotion.” At the bottom of the card is this inscription: “Nothing is so strong as gentleness; nothing is so gentle as real strength.” On the opposite page is a photo of Elliott and his mother, also circa mid-1940s. EG: That photograph was taken outside our apartment. Isn’t she beautiful? Eagle: Yes, and so modern — she must have been a trendsetter. Eagle: Moving on to your other memories; would you say that the growing up in Brooklyn, at a time when the Dodgers’ standing in the National League was more important than finding the best kale at the Park Slope food co-op, shaped and prepared you for the tough, competitive business you’re in? EG: Listen, it prepared me for life, and this business is simply another part of life. So in answering your question, I’m not really talking about show business. EG: Yes, life in general. I’ll give you an example of what I mean. When I was in the middle of second grade, the school felt that I should skip a grade. The school had just started experimenting with something called “Special Progress” for seemingly gifted children. But at the moment they chose to move me forward a grade, I was just getting comfortable, I liked my classmates, I was getting my “rhythm.” I was thinking “I can do this.” But I was too young to think I could object. However, in the third grade you were expected to read out-loud, which I couldn’t do. EG: I had no confidence! One of the factors that has been significant in my life, for good and bad, is that I have always had a problem with authority. By that I mean, that authoritative people would tell you how things were and those people weren’t necessarily right. I always had a dislike for having to conform. And it turns out I wasn’t wrong. But one has to be realistic, to deal with the real world. Eagle: After P.S. 247, where did you go to school? Eagle: In addition to your acting and dancing studies, were you also taking academic classes? Eagle: So you also took singing lessons? EG: I came back to New York and got a job in the chorus of “Rumple,” starring Eddie Foy Jr. and Gretchen Wyler. We played the Alvin Theater, which is now the Neal Simon Theater. (I loved the smell of the Alvin Theater; it reeked of show business history.) This was also the first time I went out of town with a show. We went to Philadelphia and Boston. It was a great experience. Eagle: So by then you were sure you wanted to be an actor? Eagle [applause again]: Your memory is amazing. EG: Looking back on it now, it was beyond embarrassing, but I thought, “I have to try this. I can learn something.” The idea was if that I could mimic, if I could memorize, then somehow my own talent would come out. 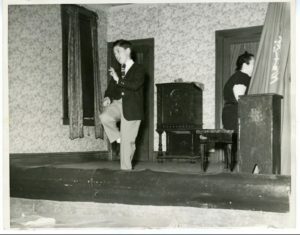 And this was the only artistic activity I was any good at — acting, singing, dancing, performing. I could draw a little; I couldn’t paint, not even finger-painting! But I remember I once saw a paperweight with the saying, “The greatest artist in the world is an uninhibited child at play.” And I subscribe to that. It’s funny, because when I repeated this to Herb Gardner [the late playwright Herb Gardner, another notable Brooklynite, wrote such hit plays as “A Thousand Clowns,” “I’m Not Rappaport” and “The Goodbye People”], he said, “an uninhibited child and Picasso.” And I said, “I didn’t know you were a materialist. I love Picasso, too, but you keep Picasso, and I’ll keep the child.” For me, without the spirit of the child, it’s all meaningless. Then, many years later, I discovered that the quote on the paperweight was actually from Picasso! Eagle: You were so young when you did, for example, “The Ernie Kovacs Show,” which was a very hip show, way ahead of its time. Were you “getting” material such as Percy Dovetonsils and the Nairobi Trio? EG: No, it went right over my head. I also appeared several times on “The Milton Berle Show.” I also did Jimmy Durante’s show. I made a couple of commercials. One was for Bonomo’s Turkish Taffy. Eagle: I remember Bonomo’s! You can buy it on Google now. 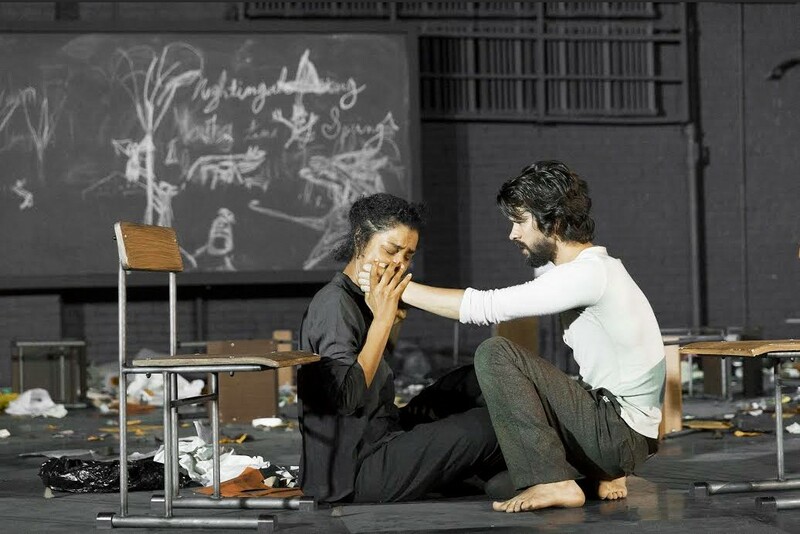 Eagle: After your Broadway debut in “Rumble,” was Jules Feiffer’s “Little Murders” next? 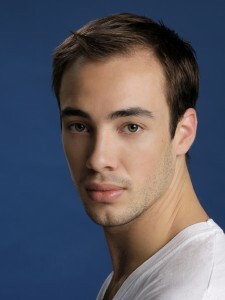 EG: Well, after “Rumple,” I started studying Modern Jazz dance with Matt Maddox. And Matt Maddox was about to choreograph a musical called “Say, Darling.” Abe Burrows directed that and Jules Styne and Comden & Green did the music and lyrics. It starred Vivian Blaine, who, of course, was the original Adelaide in “Guys & Dolls.” And I auditioned and auditioned for that show; I wanted so badly to be in it. The other thing I remember vividly was that because I wasn’t on until about 45 minutes into the show, I would go across the street from the old Madison Square Garden to watch the “Big O,” Oscar Robertson, play for the University of Cincinnati Bearcats against other college teams. Then I would scoot back to the theater just in time for my cue. EG: Yes, I was, and still am, a major sports fan. I remember my parents taking me to Ebbetts Field to see the Dodgers when I was 5 or 6. 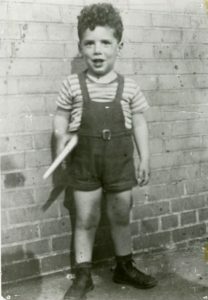 I also remember my father used to get angry with me, because I always had to go to the bathroom. And, of course, something important would happen — Duke Snider homering or Jackie stealing a base — while we were in the bathroom. My father used to get so mad at me! I’ll tell you another great sports story: Before the first Ali-Frazier fight, Jim Brown introduced me to Ali, and Ali said to me: “You do what you do as well as I do what I do.” That’s the second greatest compliment ever paid me. Eagle: What was the first? Eagle: Back to Broadway. After “Say, Darling” …? Eagle: Were you still living at home in Brooklyn during this period? EG: Yes, I was living at home until I met my first wife. Eagle: How did you meet? Eagle: So we’re talking about Barbra [Streisand]. EG: Yes, Barbra. Not only my first wife, my first real relationship; I’d never really been with anyone before. Eagle: Barbra was Ms. Marmelstein, your assistant, in the play, correct? EG: Yes. She played the secretary to my character, Harry Bogen. She was terrific. 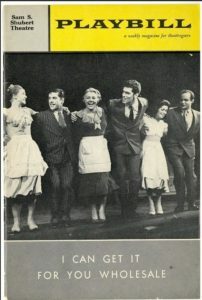 It was Barbra’s Broadway debut. 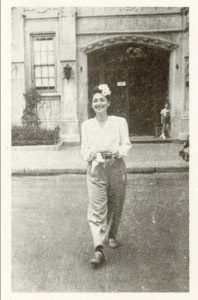 Goddard Lieberson, who produced the cast album for Columbia Records, signed her to a contract and her first solo album was released two months after the show closed. Eagle: Did the fact that you were both from Brooklyn, and Jewish, add to the appeal? EG [smiling impishly]: You should ask Barbra that question. Eagle: Barbra used to perform a lot at the Blue Angel in the Village, right? EG: Yes, I’d often go to see her there. EG: So is everything … so is Ebbets Field. The Sarasota Opera is one of the finest venues for opera. The 1100 seat auditorium of this splendidly renovated William E. Schmidt Opera Theatre, is acoustically perfect and visually stunning. Pineapple Street in front of the opera house is now named “Verdi Way.” Conductor and Artistic Director Victor DeRenzi completed his 28 year Verdi cycle with a magnificent Aida. 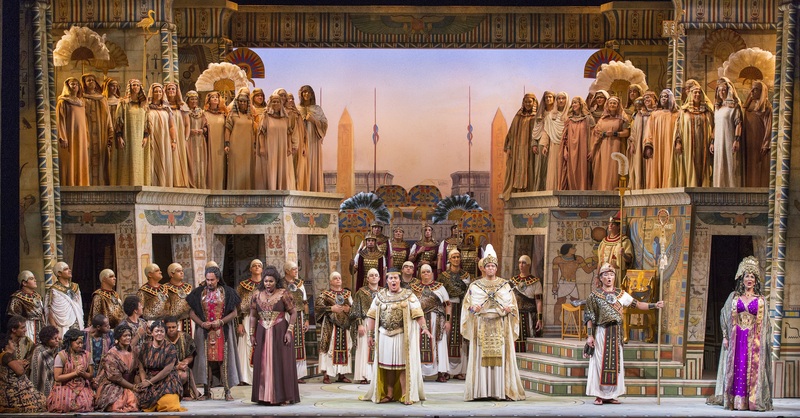 The world premiere of Giuseppe Verdi’s (1813-1901) spectacular masterpiece Aida was December 24, 1871 in Cairo, Egypt supposedly to celebrate the opening of the Suez Canal. 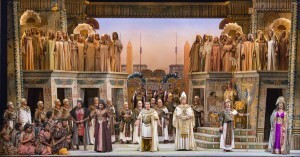 After its Italian premiere at La Scala in Milan, shortly afterwards, Aida swept the world. It should be noted that tenor immortal Enrico Caruso sang Radames in Aida at the Brooklyn Academy of Music (BAM) with the Metropolitan Opera (Met) on tour on January 17, 1910 with Arturo Toscanini conducting. Caruso sang in Aida several times at BAM until 1917. On the evening of Saturday, March 19th, before the performance, it was nice to meet and greet the staff, many of whom are or were Brooklyn residents. 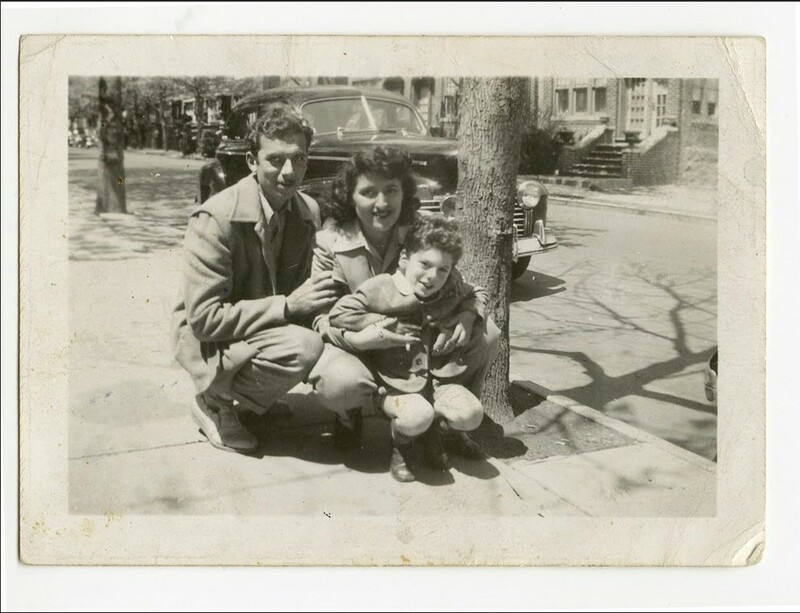 Executive Director Richard Russell once resided in Park Slope, Director of Artistic Administration Greg Trupiano is a Cobble Hill resident and Director of Audience Development Samuel Lowry, introduced us to his vivacious parents Bob and Becky Lowry from Eugene, Oregon. Recalling fondly Sam’s six years of living in Park Slope, they queried if the Blue Apron Foods store still existed and it does! We also chatted with August Ventura, Verdi filmmaker (Film “27”) and lecturer with his Mother Romola who resides part time in Sarasota with his Dad Eustacio. Visiting from New York, we met the effervescent Brian Kellow and Scott Barnes from Opera News. Finally we all entered the theatre and the magic began. Maestro Victor DeRenzi, baton aloft conjured up the opening notes of this masterpiece. The curtain lifted to show us the hall of the palace of the King of Egypt. Radames is the captain of the guards. He is pledged to Amneris the daughter of the King. Radames falls in love with the Ethiopian slave girl Aida, who in reality is the daughter of Amonasro, now also a slave but actually the King of Ethiopia. 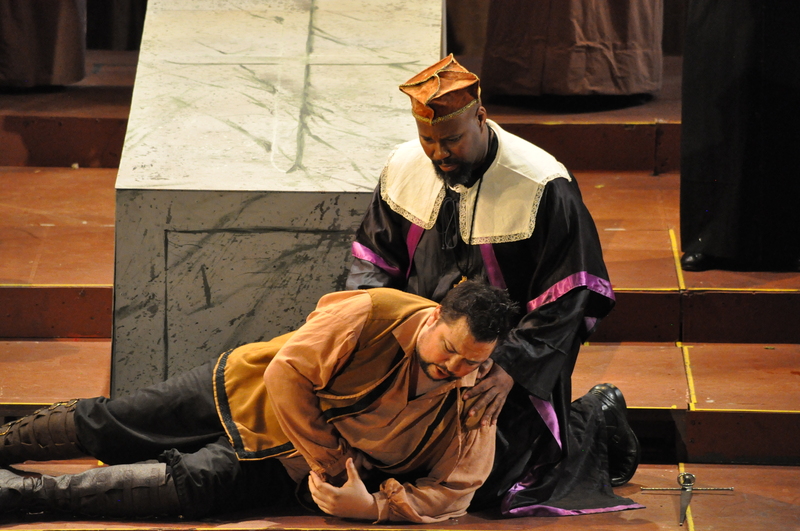 Radames gives the invading plans to Aida and is caught by Amneris and Chief Priest Ramfis. Aida and Amonasro flee to safety. Radames is put on trial and found guilty of being a traitor; he is to be buried alive. Amneris begs the judges to change their mind but to no avail. 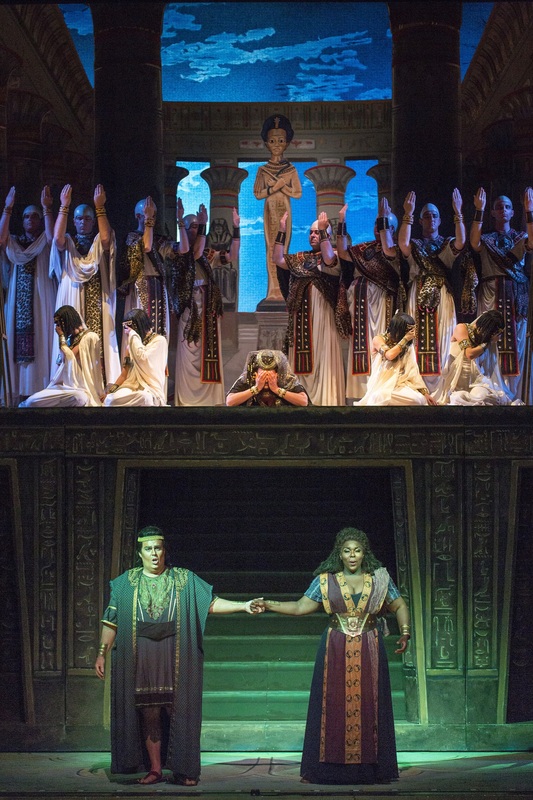 Aida has managed to sneak into the tomb where she and Radames die together with Amneris on the ground above, chanting a prayer softly. The Radames was Jonathan Burton whose singing of “Celeste Aida” revealed a powerful tenor with lyrical grace, ending the “untrono vicino al sol” first full voice then an octave lower and softly. Burton has real “squillo” (shine) to his voice. His heroic singing in the duet “Numi che duce ed arbitto” with the Chief Priest Ramfis concluding jointly with “Immensa Ptha” was thrilling. His third act finale “Sacerdote io resto a te,” was with golden notes seemingly held together with electrifying intensity. His confrontation with Amneris in Act 4 was a revelation, “Gia i sacerdoti adunansi” with generous and expansive bursts of glory. Burton’s “Morire si pura e bella” was lyrically done with pathos and a beautiful blend with Aida. The final “O terra addio” was sung with security and resignation. This was an extraordinary performance from a very promising tenor. The title role was sung by soprano Michelle Johnson. Her singing of “Ritorna vincitor!” in the first act was the revelation of an Aida of the first rank. Her creamy sound, vocal ascents and vivid charismatic persona made for many magical moments. Her confrontations with Amneris and the excellent translations made one appreciate her dilemma and the brilliant score by librettist Antonio Ghislanzoni. The conflicting emotions were all seen and felt. Ms. Johnson’s scenes with Amonasro had great impact and her sense of being torn expanded into newfound courage. Ms. Johnson’s wondrous singing of “O patria mia” with its exotic vocal turns found her “inner Aida” in full bloom. Her singing in the tomb scene and “O terra addio” was flawless. Ms. Johnson was a visually radiant and vocally compelling Aida. 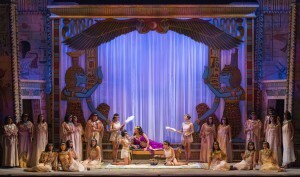 The Amneris of Leann Sandel-Pantaleo was exemplary. The part of the king’s daughter, Amneris, Radames lover in waiting and vengeful, and later repentant, is truly a scenery chewing role. 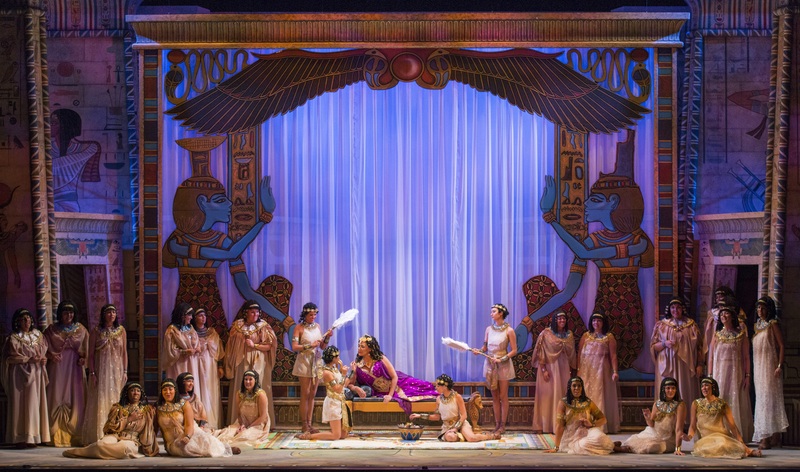 Amneris feigns love for her rival Aida and learns of Aida’s true love for Radames. Like a cat playing with a toy mouse, she revels in her ploy. Ms. Sandel-Pantaleo was at her “baddest” best in “L’abborrita rivale a me sfuggia” and “Gia I Sacerdoti adunansi” in the fourth act. Her rich versatile mezzo with its haunting chest voice truly made her a unique Amneris. When the priests declare Radames to be a traitor and condemn him to death, Pantaleo’s convulsive tears “Empia razza! La vendetta del ciel scendera!” wracked her very being and transferred these emotions to the audience. She took a big bite out of this juicy role and left an indelible impression. 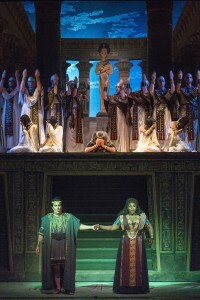 The role of Amonasro, father of Aida and King of Ethiopia was sung by Marco Nistico whose robust baritone impressed from his opening phrases “Suo padre Anch’ io pugnai.” His singing of “Ma tu, o Re, tu signore possente” was a heartfelt plea and together with the pleading chorus made for Verdian magic. 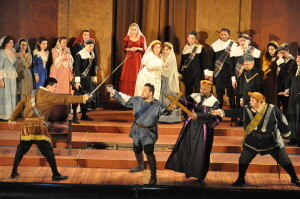 Nistico’s impassioned and powerful singing in the Schiava scene with Aida was dramatically precise. His performance so dynamic in the third act, added greatly to the drama. The King as portrayed by basso Jeffrey Beruan was both majestic and regal. His “Salvator della patria, io ti saluto” and “Gloria all’ Egitto” revealed a mellow bass of substantial quality. 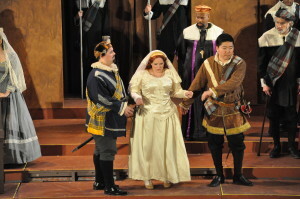 The high priest Ramfis of Young Bok Kim was sung in a strong basso and shined in “Mortal, diletto ai Numi” in the “Immensa Ptha” duet with Radames. His Ramfis had dignity and depth vocally and was a vivid portrayal of justice served and mercy ignored. Tenor Matthew Vickers was a commanding messenger in his brief moment to shine and he did indeed with vocal strength and urgency. The Grand March with the many treasures, dazzling costumes and what appeared to be a golden calf tribute was truly spectacular! The stage was full of extras top tier and bottom with trumpeters on both sides of the stage. It was a marvelous montage, beautifully staged and free flowing with feathers and pageantry galore! The audience loved it! The act three set design was ravishingly beautiful with its shimmering moon, river waves, barge, palm décor and pyramids. Kudos to Conductor Victor DeRenzi whose brilliant conducting of this magnificent score from the Grand March to the gentle finale was impeccable. “Words for music” supplied the subtitles which Maestro Victor DeRenzi also translated. 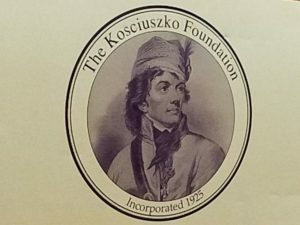 The musicians of the Sarasota Orchestra were truly inspired. The final Aida of a 28 year dream will live on in memory and a final Verdi concert the next evening will complete this monumental effort. The stage direction by Stephanie Sundine made for a stage that crowded spectacle with ease, flawless movement and striking vistas. 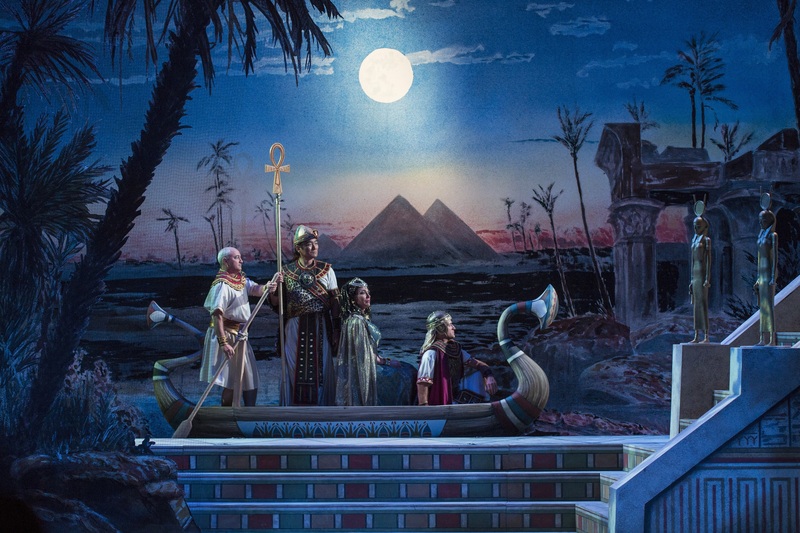 The scenic designer David P. Gordon created images that are unforgettable like some living breathing tableau. Howard Tsvi Kaplan, costume designer, gave us breathtaking costumes and made us feel at home in this time and place. Ken Yunker’s lighting design, so viable in the third act and the tomb scene also fast framed the Grand March finale like a time travel camera flash. The ever creative hair and makeup designer Joann Middleton Weaver’s work was striking, never garish. The chorus of Sarasota Opera’s apprentice and studio artists, under the astute hand of Roger L. Bingaman was magnificent. The choreographer, Miro Magloire and dancers Meghan Connolly, Holly Curran, Ariana Henry, Sasha Paulovich, Nicholas Peregrino and Preston Swovelin made sense of the various dancing scenes. The dance of the priestesses and the dance of the young Moorish slaves were a pleasure to behold. 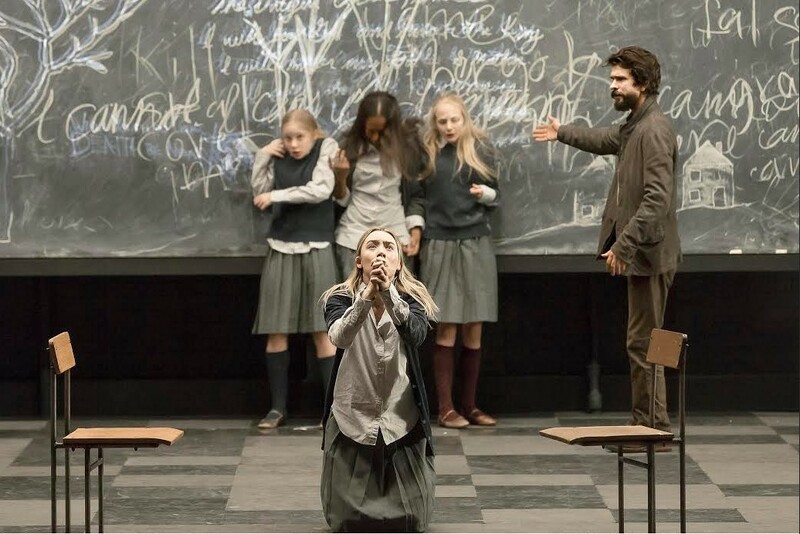 When the curtain rises on the new production of Arthur Miller’s “The Crucible” at the Walter Kerr Theater (which boasts the dream cast of Saoirse Ronan, the star of “Brooklyn;” Ben Whishaw; Sophie Okonedo; and Ciarán Hinds), the audience sees a gloomy classroom with a blackboard, dim, drab overhead lights and three rows of seated teenage schoolgirls, in prim, black and gray uniforms with knee socks, sleeveless pullovers and blazers, all facing forward with their backs to the audience. Faintly, the spectators hear a chorus of girls’ voices, but the words are unintelligible. The setting and the sounds are both ordinary and spooky. 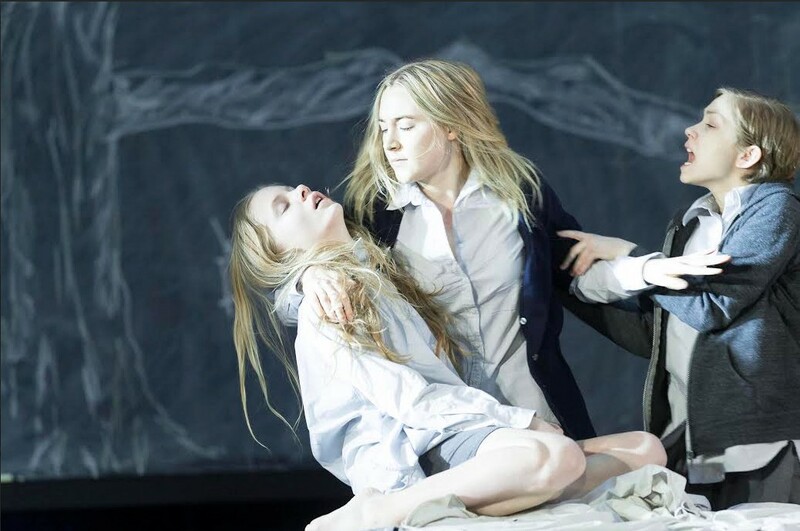 Before there is a chance to decide which description fits best, the curtain descends, and then quickly rises again on the same set, but now fully lit, with a young girl prone on a gurney, being administered to by a clergyman. In the background stands another schoolgirl, brooding and concerned. 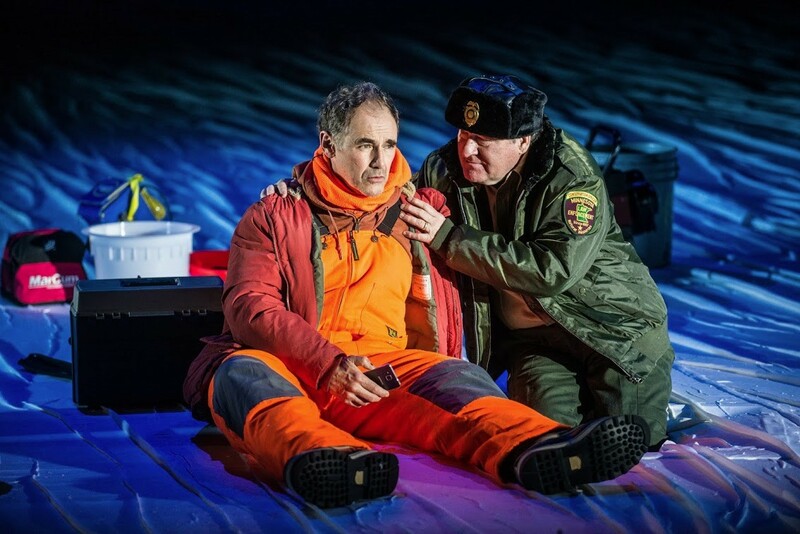 Theatergoers who saw last year’s “Antigone” with Juliette Binoche at the Brooklyn Academy of Music (BAM) and the recent revival of Miller’s “A View from the Bridge” will recognize where they are: in Ivo-land. 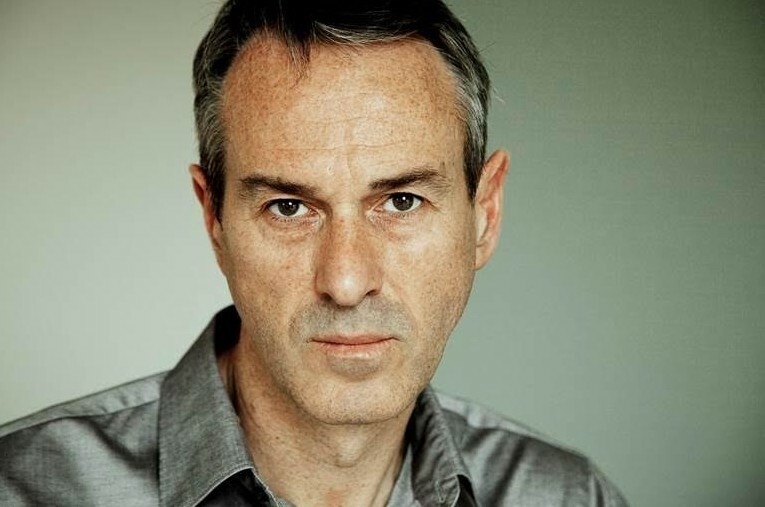 The Belgian-born Ivo van Hove is everywhere; last November he also directed the limited run of “Lazarus,” a musical collaboration between the late David Bowie and the Irish playwright Edna Walsh. 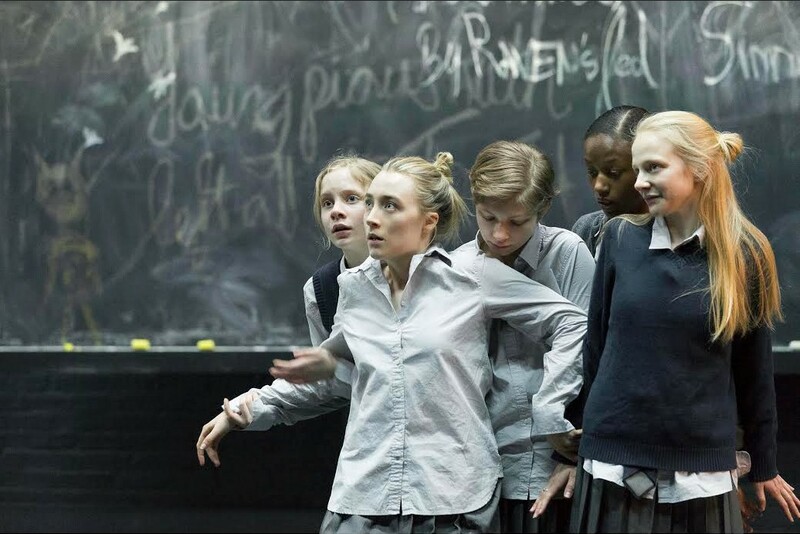 With “The Crucible,” which officially opens this Thursday night, van Hove makes his Broadway debut. He is, indisputably, having his New York moment. Eagle: Nothing in the theatrical or cinematic canon — Euripedes, Shakespeare, O’Neil, Miller, stage adaptations of Bergman, Cassavettes, Pasolini, Viscounti films — seems to intimidate you. How did you become so fearless? Van Hove: Well, you know, you only live your life once. Why not take chances? Before we begin a production, I always tell my creative team that we’re in the Olympics. Our goal should be the gold medal. The stage work and the film adaptations I choose to do are always driven by the actors, not by the beauty of the visuals or the physical design. As a novelist does through his writing, I want to express through my theatre work, my feelings, my passions. Eagle: You have said about “The Crucible” that “…it is not a play about good and evil; it is about evil within goodness and goodness within evil.” Can you elaborate? Van Hove: Now that I have done two Miller plays, what I have discovered is that he deals with ethical problems, often in black and white terms. But I don’t see things as that black and white. Take Abigail [Williams, who is the catalyst for the Salem witch hysteria and subsequent trials]. Listen carefully to what she says in the first act, when she reproaches John Proctor for ending their relationship. She really felt, for the first time in her life, respected as a woman. She’s 17. The fact that John, her first lover, rejects her is earth-shattering. She is very fragile. For the Puritans, being a young girl meant three things: You had to always obey your parents (especially regarding even the hint of anything sexual); you had to became a servant, as Abigail was for John and Mary Procter; and you were not allowed to truly transition from a girl to a woman. Abigail is so often played as the evil villainess of “The Crucible.” But I don’t see her that way. Remember, she is the only character to escape Salem, to seek her freedom. John and Mary stay — and pay the price. Elizabeth Teeter, Saoirse Ronan, Tavi Gevinson, Ashlei Sharpe Chestnut and Erin Wilhelmi. Eagle: Why do you insist that your actors be “off-book” from the first day of rehearsal? And why, in rehearsal, do you have your actors work steadily through the text, reaching the end of the play just before the first public performance? Van Hove: I believe it is great for actors, in rehearsal, to discover the play. After all, that’s the way one lives one’s life —not knowing from one day to the next what is going to happen. 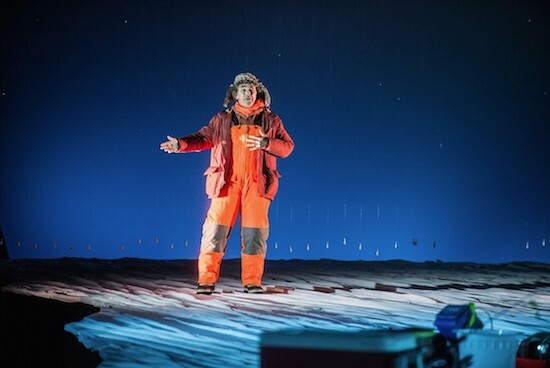 As with life, there should be uncertainty; I want my actors to unravel the play, scene-by-scene, to react to the uncertainty as they would in real life. When I have the actors rehearse the play, day-by-day, in chronological order, I don’t have to give them a lot of instructions. They are coming to their own recognition of the text. Which also makes them more comfortable and more natural. 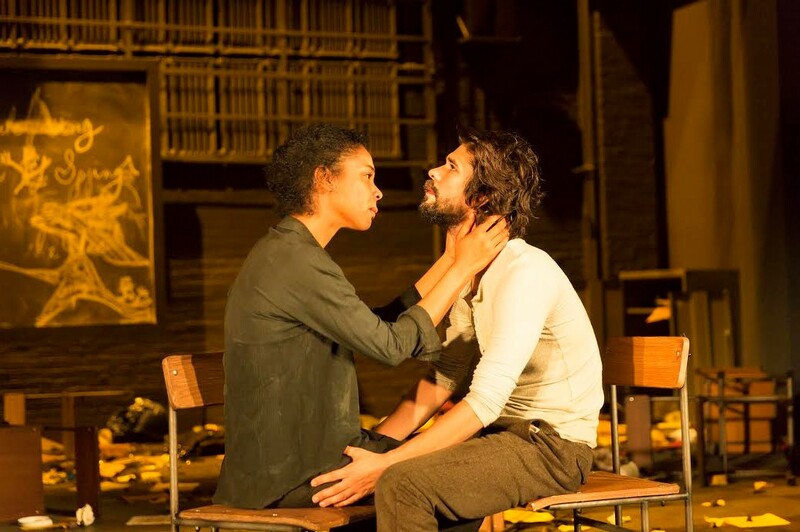 Sophie Okonedo and Ben Whishaw. Eagle: Finally, since you have been so bold in taking iconic films (to cite just a few, Ingmar Bergman’s “Scenes from a Marriage,” John Cassavetes’s “Husbands,” Luchino Viscounti’s “Rocco and His Brothers”) and transforming them into theater, when are you going to adapt “Star Wars” for the stage? Ben Whishaw, Bill Camp, Tavi Gevinson and Ciarán Hinds. Eagle: Sorry, I was joking. 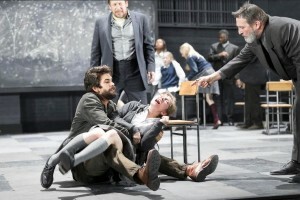 Van Hove (laughing): I may be, as you said, fearless, but I’m not reckless! The Crucible runs through July 17 at the Walter Kerr Theater. Elizabeth Teeter, Saoirse Ronan and Tavi Gevinson. Saoirse Ronan (foreground), Elizabeth Teeter, Ashlei Sharpe Chestnut, Erin Wilhelmi and Ben Whishaw (background). Lucia (Alexis Cregger) & Edgardo (Ben Sloman) pledge their love. Photo by George Schowerer. 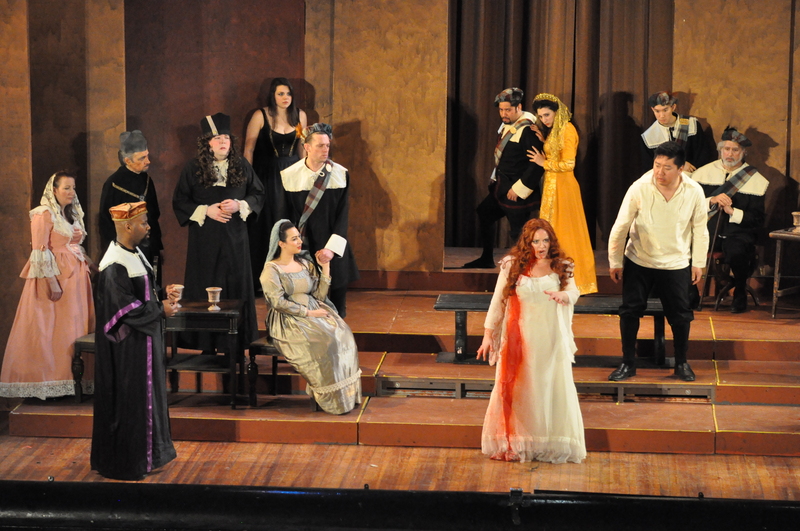 On the afternoon of Saturday, March 5th, the Regina Opera’s 46th season continued with an exciting Lucia di Lammermoor by composer Gaetano Donizetti. (1797-1848) For those few precious hours, Sunset Park in Brooklyn was transformed into La Scala in Milan or Lincoln Center. Lucia di Lammermoor is based on Sir Walter Scott’s novel The Bride of Lammermoor and is set in late 17th century Scotland. The libretto is by Salvatore Cammarano and the first performance was at the Teatro San Carlo in Naples, Italy on September 26, 1835. Lucia (Alexis Cregger, center) is unwillingly escorted into the wedding hall. Photo by George Schowerer. Enrico wants his sister, Lucia, to marry Arturo which will greatly improve the family’s financial situation. Lucia however loves Edgardo who is a sworn enemy to Enrico. By forged letters, Enrico convinces Lucia that Edgardo has abandoned her, and forces her to marry Arturo. Edgardo “crashes” the wedding, denounces Lucia, throws back her ring and is escorted out with swords drawn. Raimondo Bide-the Bent, a minister, restores the peace. We soon learn that Lucia has gone mad and has stabbed her groom, Arturo, on their wedding night. 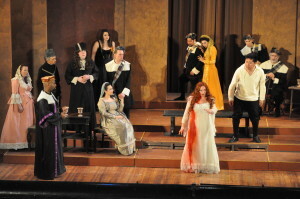 Lucia then appears with the dagger, delirious, in a blood stained gown. Edgardo goes to his family tomb, is told of Lucia’s death and stabs himself. Lucia Ashton was sung by Alexis Cregger whose singing of “Regnava nel silenzio” was haunting. Ms. Cregger’s coloratura has a quick vibrato and a shimmering dream like quality that is beguiling. Her singing of the love duet with Edgardo “Verranno a te” was both lyrical and ardent. Ms. Cregger’s thrilling ascent in “Se tradirmi tu potrai” was golden age in its quality like a sudden burst of fireworks. Her high note finale in the famed sextet “Chi mi frena” was a wonder. Edgardo (Benjamin Sloman, center) crashes the wedding, leading to a sword fight. Photo by George Schowerer. “Il dolce suono” and the ensuing “mad scene” were sung with pyrotechnic fierceness with trills, cadenzas, highs and lows in a dazzling panorama of colors and emotions ending in “Sparigi d’amaro pianto” with a spectacular high note above the orchestra and chorus. Cregger’s Lucia was flawless and spectacular! 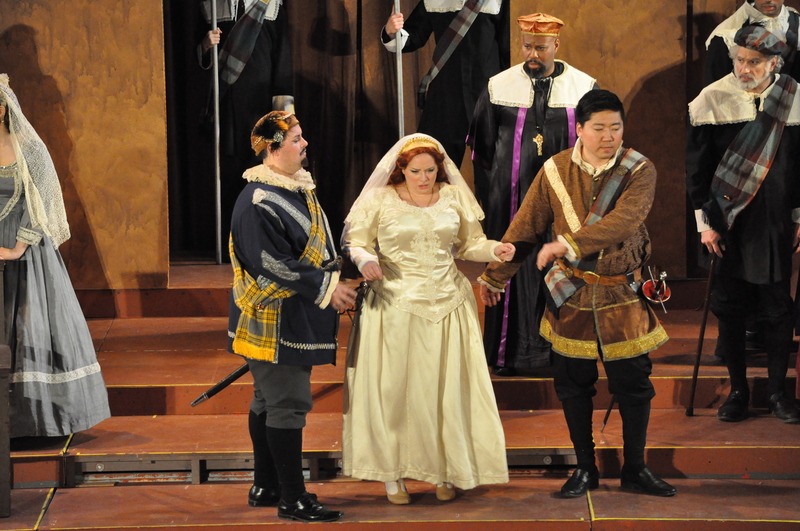 Lucia (Alexis Cregger, center) has shocked the wedding guests by killing her bridegroom. Photo by George Schowerer. 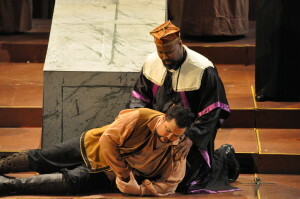 Raimondo (Isaac Grier) supports the dying Edgardo (Benjamin Sloman, left) who has stabbed himself in grief. Photo by George Schowerer. Edgardo di Ravenswood was sung by the rapidly rising Australian tenor Benjamin Sloman. His ardent powerful singing of “Sulla tomba che rinserra” and “Qui di sposa eterna fede” made one sit up and take notice. The ensuing duet “Verranno a te sull’ aure” with its soaring melodies had us enraptured as Ms. Cregger and Mr. Sloman rose to heavenly heights, their voices blending and a few new, trill like additions added to this captivating brew. Sloman’s top voice steely, steady and secure, combined with Alexis Cregger’s flowing sound, made for a “golden age duet.” His penetrating notes in the sextet and his declamatory power in the denunciation scene “Hai tradito il cielo e amor” made for great theatre. Sloman’s beautifully framed and poignant singing of “Fra poco a me ricovero” and “Tu che a Dio spiegasti l’ali” made him an Edgardo of the first rank. Lord Enrico Ashton was sung by Seung-Hyeon Baek whose robust baritone negotiated the passages of “Cruda, funesta smania” with strength and angst. 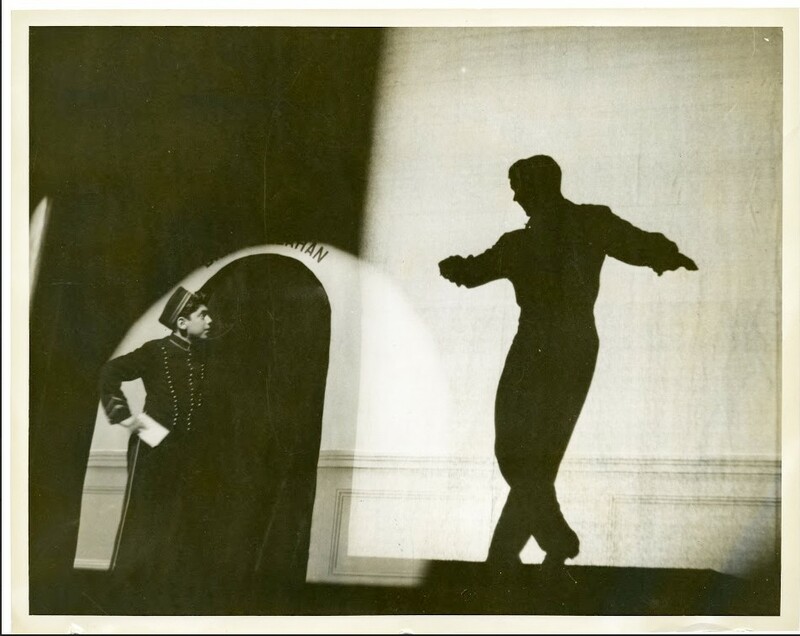 His exciting singing with Lucia of “Se tradirmi tu potrai” evoked the duet in Rigoletto with his stirring high note. He was a bad and angry brother. His remorse at Lucia’s death was genuine. Baek’s portrayal was vivid and masterful but he needs a little more “push” into getting into Enrico’s skin with a bit more angst. He is young and his future promising. Raimondo Bide-the-Bent, a peace keeping minister was beautifully sung by Isaac Grier whose basso cantante provided the glue that literally held people together throughout the opera. His singing with the chorus of “Cessi, ah cessi” and “O meschina” and “Tu che a Dio” at the tomb scene was done with extraordinary power and beauty. The unfortunate groom, Lord Arturo Bucklaw was sung in a sweet and strong tenor by Mario Bacigalupi. His singing of “Per poco fra le tenebre” and “Dov’e Lucia” was done with genuine conviction and lamb before slaughter was the prevailing thought. The smaller roles were all done with vocal heartiness and aplomb. The Normanno of Ray Calderon, the excellent Alisa of mezzo Jennie Mescon, the Deacon of versatile Wayne Olsen and the notary of Thomas Geib were all of a high quality. The conductor Dmitry Glivinskiy gave a brisk and spirited reading of this exciting and melodic score and brought out every bit of its toe tapping vigor. The 32 musicians who seemingly put their souls and skills into it followed as a unified force, his every baton movement. Plaudits to Richard Paratley who brilliantly accompanied Lucia on the flute in the mad scene, Kathryn Sloat whose harp playing evoked the angels in “Quando rapito” in the first act. Also Dmitri Barkan’s oboe solo so poignant and concertmaster Yelena Savranskaya and her magic violins.The Scottish wedding music was so joyful in contrast to the somber melodies to come. The chorus sang with perfection strength and elegance throughout and especially in the final act.The melodies haunt me still. Linda Lehr’s brilliant direction and staging made for vivid fight scenes, unshakable visions of the mad scene and a haunting tomb scene with the monks and mourners holding candles. Lehr’s scenes (So Gothic and mysterious) sometimes are “frozen” as in mid flight-a brilliant touch! Tyler Learned’s set lighting was truly mood evoking. The costumes by Julia Cornely were outstanding and the red and gold gowns at the wedding scene were dazzling. Edgardo’s outfit was superb and Lucia’s blood soaked gown as she left the unseen boudoir and entered the reception was unforgettable. The subtitles by Linda Cantoni Vice President were excellent and gave the newcomers vital dialogue. We thank the Regina Opera for a truly splendid afternoon of opera at its best-not updated tampered with or modernized-just the brilliant genuine article. There were ovations, cheers and many bravos echoing in the hall at the conclusion. Thanks to Francine Garber, Linda Cantoni, Joseph Delfausse, Alex Guzman and all those behind the scenes who make it all possible. Bravo! This past Sunday night at St. Ann’s Warehouse in DUMBO, Mark Rylance’s and Louis Jenkins’s farcical, lyrical, melancholic, brilliant play “Nice Fish” had its opening night performance. Combining equal measures of Eugene Ionesco and Sherwood Anderson, “Nice Fish” is still sui generis. Alternately hilarious and doleful, the play is indisputably the yardstick by which the rest of Brooklyn’s 2016 theatrical season will be measured. Congratulations of the highest order to St. Ann’s Artistic Director Susan Feldman, Minneapolis’s Guthrie Theater, which commissioned the play in 2013 and, most of all, to the American Repertory Theater, which produced it. It would be churlish to single out any of the five cast members for praise. 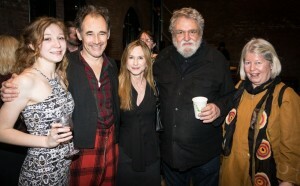 Suffice it to say that Rylance, Raye Birk, Kayli Carter, Bob Davis and Jim Lichtscheidl are all uniquely, and distinctively, outstanding. As are Claire Van Kampen’s direction and music, Todd Rosenthal’s scenic design and Japhy Weidman’s lighting design. 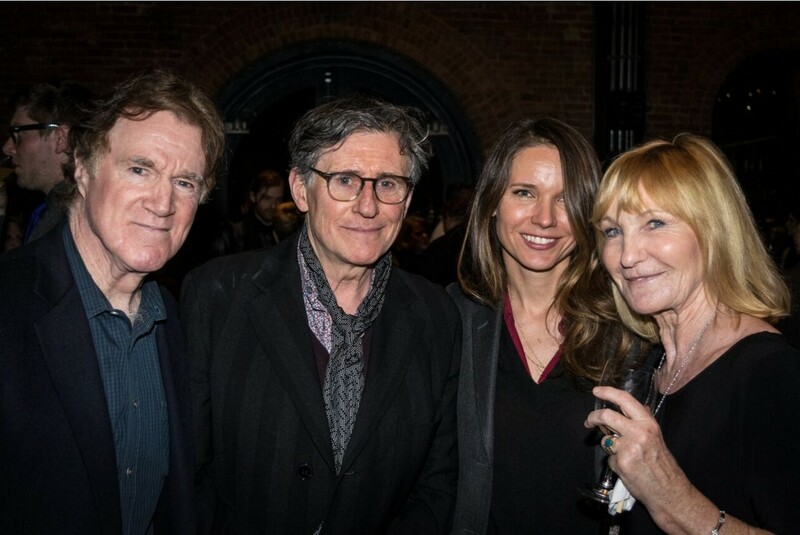 Among the guests praising the production at the after party were actors Holly Hunter, Gabriel Byrne, ex-New York Jets great and NFL color commentator John Dockery and Diane Borger, the play’s producer (who graciously gave up her aisle seat to this reporter). “Nice Fish” runs through March 27 at St. Ann’s Warehouse. 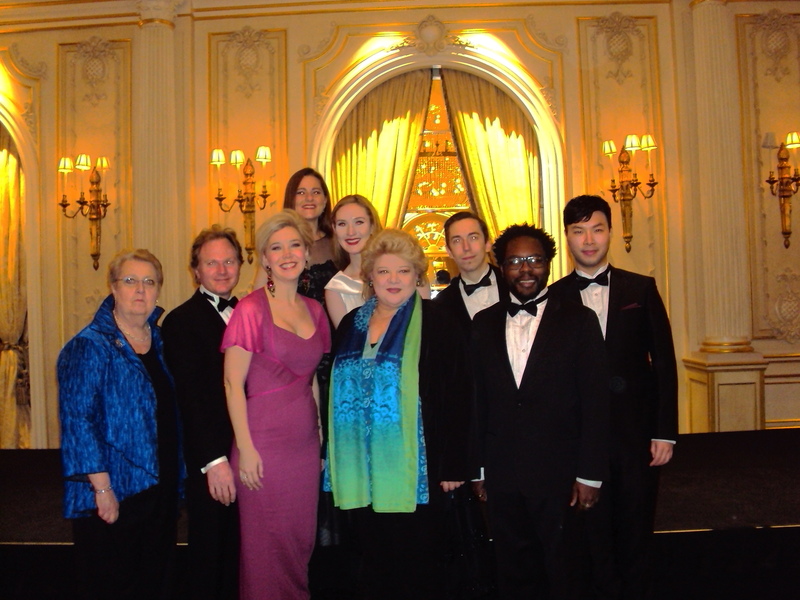 On Sunday, January 17th, Opera Index held its Distinguished Achievement Awards Dinner at the JW Marriott Essex House in New York City. 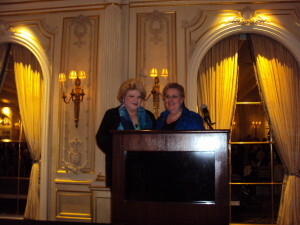 The great mezzo soprano, Dolora Zajick was the honored guest. An operatic recital of the 2015 Opera Index Award Winners was also presented. Jane Shaulis, who is a mezzo soprano with the Metropolitan Opera and the new President of Opera Index, enthusiastically hosted this lively production. In her introductory remarks, Ms. Shaulis announced the donations by Opera Index towards the scholarships for the young promising singers and the great pride she has as a performer in helping these talented awardees attain their goals. After hors d’oeuvres and libations the crowd of several hundred went into the glittering dining room for dinner and the operatic recital. The gifted pianist Michael Fennelly accompanied the singers with dexterity and precision. Susannah Biller sang “Ah! Je veux vivre” from Gounod’s Romeo and Juliette. Ms. Biller possesses a sparkling coloratura soprano and sang an eager, ardent and fearless performance with dazzling agility and fully captured Juliette’s adolescent liberation. Ms. Biller’s high note near the finale was projected into space like Cupid’s arrow. She held the final note as if embracing her Romeo. Samantha Hankey regaled us with “Allez, laissez-moi seul” from Cendrillon by Massenet. Ms. Hankey is the caretaker of a warm and luscious mezzo and captured the French style. Her sound caresses and comforts and her vocal palette offers flowing tones and many colors. Jonas Hacker offered “Una furtive lagrima” from Donizetti’s “L’elisir d’amore.” Mr. Hacker is the landlord of a fine tenor voice and is now harvesting and displaying his years of planting. Hacker’s voice has a strong even quality, is manly and straightforward, with a good diminuendo and an excellent cadenza at the finale. Megan Marino, mezzo soprano and Will Liverman, baritone sang “Dunque io son” from Rossini’s Il barbiere di Siviglia with wit and elan. Ms. Marino, a feisty, clever Rosina flew through the cadenzas and scales with abandon. Mr. Liverman showed Figaro’s quicksilver mind with vocal fireworks. Both of their flights into the vocal stratosphere were thrilling! It was truly a fun ride and the audience had a good time! Siman Chung sang “Di tanti palpiti” from Rossini’s Tancredi. His countertenor was never false, in full bloom and he sang this melodic air with excellent diminuendos, strong fioratura and uncommon elegance. Lastly, Will Liverman sang Gryaznoy’s aria from the Tsar’s Bride by Rimsky-Korsakov in Russian as if he was Russian born. Liverman used this showpiece with its high notes, robust lows and dramatic utterance to showcase his extraordinary voice and splendid vocal gifts. He is from Chicago and is the premier Lissner Charitable Fund award winner which was presented by Karl Michaelis. The award ceremony followed with each singer receiving their well-deserved awards. Matthew Epstein Artistic director, Artist manager and consultant whose 40 year career has been vital to the opera world, was the presenter to Dolora Zajick. Mr. Epstein spoke eloquently of her powerhouse performances, humanity and humor and as a legend in her own time. Ms. Zajick graciously accepted the gift and in a humorous and joyful talk enraptured us all. She told the audience of some memorable performances especially one where the tenor’s wig caught fire in Il Trovatore and another from Rusalka where an artificial cat failed to comply and was thrown in her witches brew! Ms. Zajick has been wowing them at the Metropolitan Opera and all over the world since 1988. Brooklyn can never forget her glorious Santuzza at the Regina Opera circa 1980. Ms. Zajick is happy to have her own organization, The Institute for Young Dramatic Voices in Orem, Utah to help aspiring singers. Dolora Zajick said “I can still deliver the goods” and she sure can – brava! We sat at the table of Stephen De Maio, President of the Gerda Lissner Foundation with Eve Queler conductor, Robert Lombardo vocal agent, Will Liverman baritone, Gloria Gari (Giulio Gari Foundation) presenter Joyce Greenberg, patron presenter, Karl Michaelis and Michael Fornabaio. 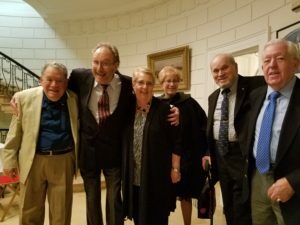 It was a pleasure to meet and greet PBS’ Midge Woolsey and husband economist Jerry Stolt, Italian Vice Consul and Commendatore Stefano Acunto and wife Carole, President Sachi Liebergesell from the Licia Albanese-Puccini Foundation, jewelry appraiser Mark Bunda, General Counsel Brian O’Connor Esq. 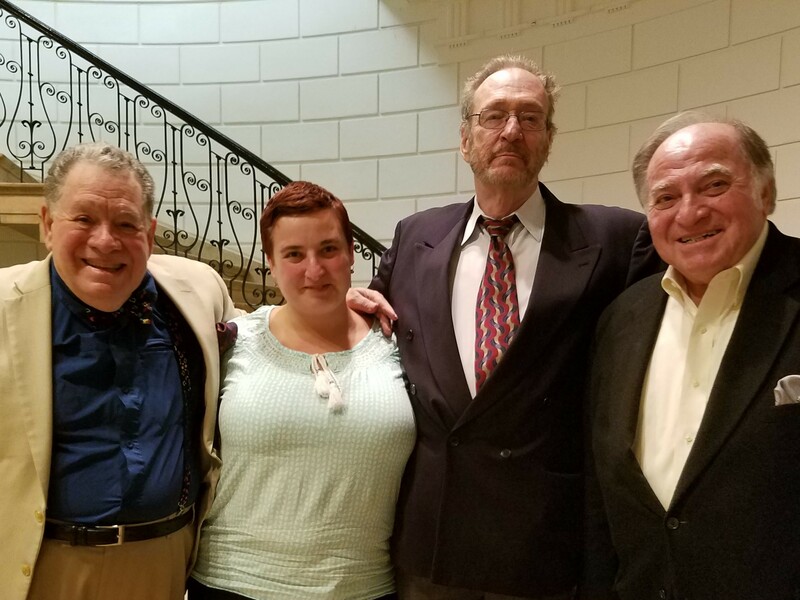 and wife Maura, who reminisced about their recent trip to Sicily, Duane Printz from Teatro Grattacielo, Bill Ronayne from the Mario Lanza Foundation located in Brooklyn. Also present were famed legendary sopranos Elinor Ross, Lucine Amara, Elaine Malbin (Brooklyn’s own) and mezzo soprano Rosalyn Elias. 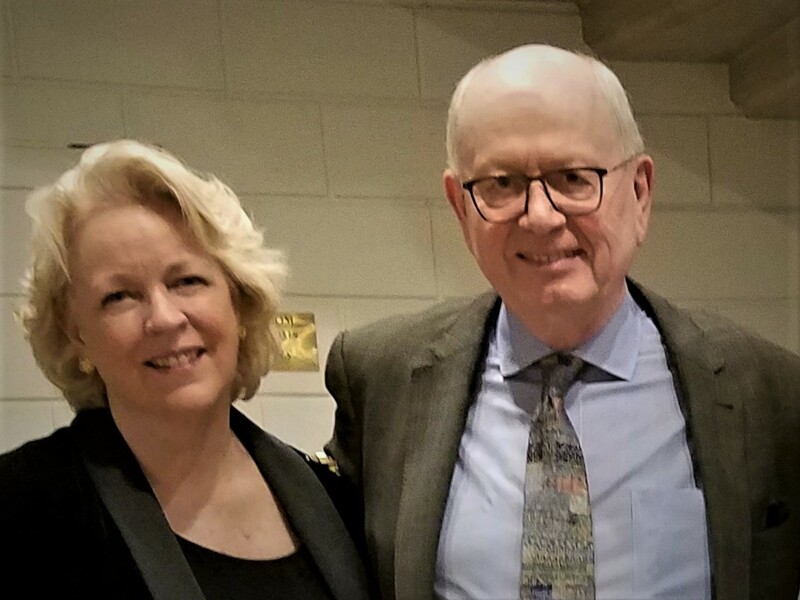 What a joy to greet Dagmar Tamura, wife of the rising Met Opera tenor Ricardo Tamura who was rehearsing for his forthcoming Turiddu in Cavalleria Rusticana at the Metropolitan Opera. 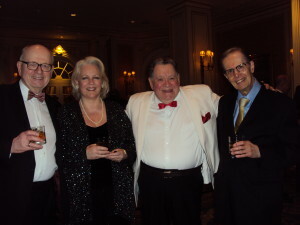 What fun to chat with Opera Index Treasurer Murray Rosenthal and Vice Presidents Philip Hagemann and Janet Stovin and family, Board member John David Metcalfe, sponsor Doris Keeley, poet and patron Cavaliere Edward Jackson, composer Stephen Phebus and wife Linda Howes, Ken Benson radio host, vocal agent and erudite Brooklynite. Presenters were the ever dapper tenor Cesare Santeramo and Dr. Robert Campbell and Met comprimario tenor Anthony Laciura and wife Joelle, all of whom were a vital part of the festivities. 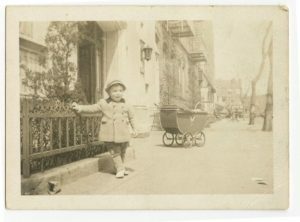 When I was a youngster in Bensonhurst, Brooklyn and an aspiring opera singer (The boy Caruso of Brooklyn), with no one to guide my career, I would be in a room listening to Toscanini and the NBC Orchestra on the radio, my head pressed to the speakers, while everyone else was listening to rock and roll. Now, decades later, I found my “comfort zone” in supporting this great art form and encouraging others to do so by giving a “push” in the right direction for gifted young potentially great singers of the future. Bravo – Opera Index, Jane Shaulis and Joe Gasperec, the dynamic duo who made this magnificent event possible! When we left this elegant room it was snowing outside-the first flakes of winter. To Judy and I, it was like the confectionery sugar sprinkled atop the pastries at our local Italian bakery. How sweet it was and bravi to all! 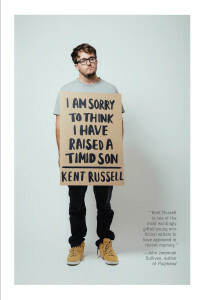 “I am Sorry to Think I Have Raised a Timid Son,” Kent Russell’s irresistibly engaging debut collection of essays, intertwined with personal history, is easily one of the best books of the past year. In a uniquely homespun, yet masterfully polished voice (think Mark Twain meets Joan Didion) Russell has us from the book’s title, which is actually a quotation from Daniel Boone, whose presence and notions of masculinity set a template of sorts for the essays and reflections that follow. 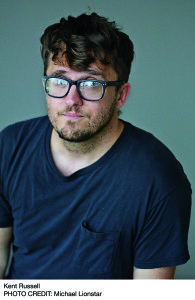 Mixing autobiography (in particular, the Turgenev-esque healing of wounds – or at least Mexican stand-off – between father and son) with such wide-ranging topics as a stay on a remote island with a present-day Robinson Crusoe and a visit with a former hockey enforcer looking back on his bruiser’s life, Russell merges erudite insight with highly-developed powers of observation. On a frigid and overcast January afternoon, at lunch in Fort Greene’s Cafe Paulette, I begin our conversation by asking Russell how he came to live in Brooklyn. KR: I moved to New York to go to NYU’s Graduate School of Journalism. My sisters Lauren and Karen [Note: Karen Russell is the wildly inventive and prodigiously gifted author of Swamplandia! and Vampires in the Lemon Grove] were living in Washington Heights. Because I got a job at Yeshiva University, I stayed in Washington Heights until I decided to focus on my writing and moved to Brooklyn. KR: Truthfully, no. I mean I’m certainly aware of them and I know they live in Brooklyn, but I tend to hang mostly with fellow ex-Floridians. It’s a very small diaspora. I teach a course at Columbia so, of course, I have colleagues and acquaintances on campus. And friends in Brooklyn. But my inner radar seems to always point me in the direction of folks from my home state. Eagle: You write about, to put it mildly, some fairly eccentric people. It would have been so easy to have ridiculed them, to have hoisted them on their own petards. But you scrupously, and generously, avoid this. How did you resist the temptation? KR: Actually, since I’m not someone who’s usually forthcoming, I feel a sense of responsibilty when writing about others. My starting point is always to ask questions. Whenever you report something — especially when it’s something about someone else’s life, about their more intimate stuff — you become like a simpering [talk show] host insofar as you want to make the subject feel as though you’re here for them only, you’re their closest confidante in the world and, oh yeah, don’t worry about the live studio audience all around us. It’s a lot like what Janet Malcolm elucidated in the first few pages of “The Journalist and the Murderer.” I don’t have a performative persona; I like to observe and just be open to the world. One of my literary heroes in that regard is Montaigne. Eagle: Your use of metaphors (“feet slow as Christmas.” “like raised hands eager to ask a question”), adjectives (“gnatty drizzle,” “peep yellow”) and verbs (“ragdolling,” “Pollock’ed”) is truly astounding. How do you come up with these? KR: My sister Karen and I joke about who can come up with the best adjectives. We usually run neck and neck. One source I’ve discovered for some of this stuff is a three volume dictionary of American slang. I’m always trying to top myself. KR: (Laughing) I don’t know how I come up with some of this stuff. When you ask me me about these one-liners and bon-mots and crazy metaphors, I guess it makes me think of sword fighters. Like, I am obviously not a sword fighter, nor have I ever been one. But I imagine that the best, most fluid, most reactive and most dangerous sword fighter is the one who isn’t worried about getting hurt. You know? The one whose head is empty, who can just “flow.” That’s the state I aspire to when I’m writing. Eagle: Growing up, were you an avid reader. And who, and what, did you read? KR: Everyone in our family read voraciously – and eclectically. My mom would read self-help books, followed by deep, intellectual tomes, followed by pulp thrillers. Karen read so much that she would be like Mr. Magoo, walking into things with a book in her hand. She’d be reading the cereal box at breakfast. Also, every Friday our mom would take the three of us to the local Borders and tell us to pick out three books. It didn’t have to be the canon; it could be any book, by any author. 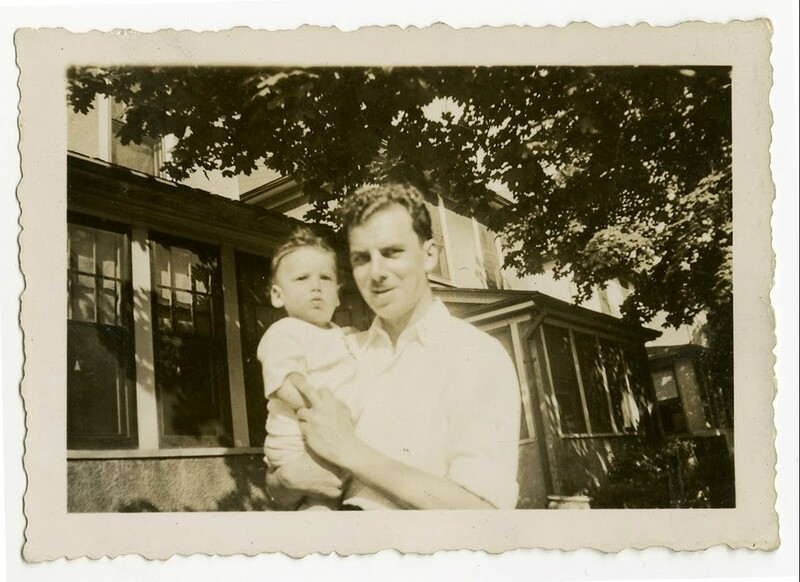 Our tastes and interests were wide-ranging and I believe this enriched our writing – and our lives. Eagle: Finally, the cover of your book is so droll and apropos. 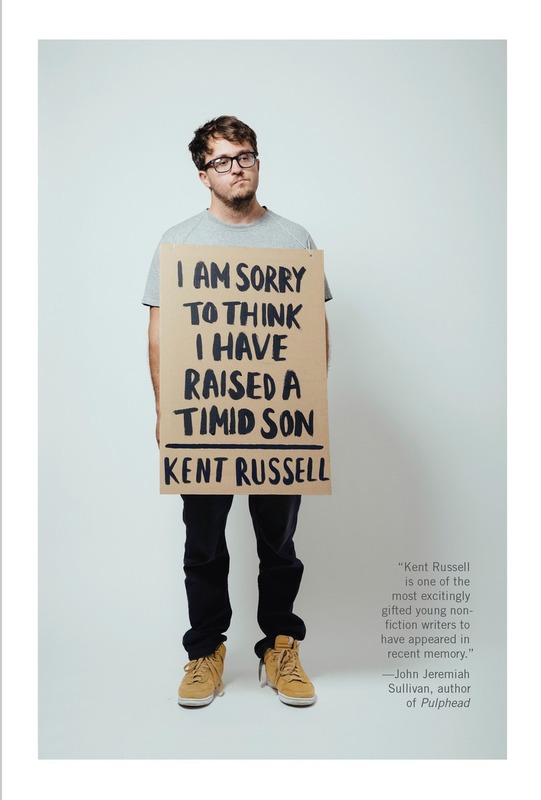 [Note: the book’s cover is a photo of Russell wearing a sandwich board with the title hand-lettered on a sandwich board.] Whose idea was it? KR: The brains behind the cover was Peter Mendelsund. You should Google some of his other covers; you’ll see that the dude is a legit master. I was more than a little skeptical about his idea, but he seemed very sure of it, so I went with it. I knew well enough to give an artist his freedom, and to trust in his vision. Plus, he orchestrated my first (and most likely last) photo shoot! Since 1964, when it became the second building constructed on the new Lincoln Center campus, the New York State Theater (known since November 2008 as the David H. Koch Theater) has been home to the New York City Ballet, one of the city’s, and the world’s, great cultural treasures. As one walks into the lobby, (and now that THE NUTCRACKER has begun its annual holiday season, through January 3, 2016, there will be multitudes entering) on the right wall closest to the entrance, in alphabetical order, are black and white photographs of NYCB’s principal male dancers. The first photograph is of Jared Angle, who has been a principal since November of 2005. Next to him is a photograph of his brother Tyler Angle, who has been a principal since since October of 2009. (The hierarchy in ballet is “apprentice,” “member of the corps de ballet,” “soloist,” and, finally the highest ranking attainable, “principal dancer.”) Although they are originally from Altoona, Pennsylvania, they both now reside in Brooklyn, as does a third brother Bradley. It would seem the Angles of Altoona have colonized the borough of Brooklyn. Tyler, in particular, has become a diehard Brooklynite, living in Brooklyn Heights since 2012. In truth, however, his family’s Brooklyn connections goes back much further. The Eagle spoke by telephone recently with Angle, who will be dancing a selection of performances in this season’s production of The Nutcracker. Eagle: What drew you to live in Brooklyn? Angle: When I first came to New York in the Fall of 2001 to study at the School of American Ballet (Note: SAB is the official school of the New York City Ballet), in order to be close to the School, I essentially lived at Lincoln Center. By 2009, when I became a principal, I wanted to put some geographic and pyschic distance between where I worked and where I lived, and because my father’s sister, my aunt Rosie, raised her family in Brooklyn, the borough was my first choice. In fact, another sister of my father’s, my aunt Shirley, also lived in Brooklyn; her husband was an NYPD beat cop. 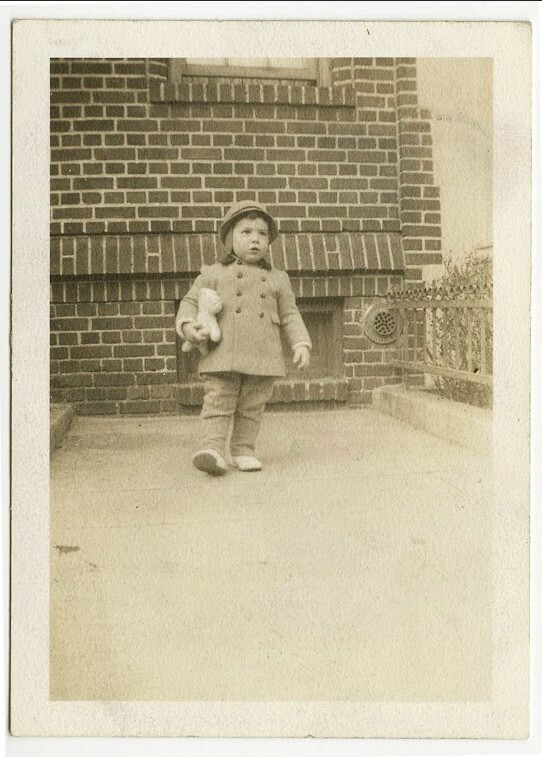 I had been visiting Brooklyn since I was ten. There was not the slightest doubt that was where I wanted to live. Eagle: What are some of your favorite Brooklyn restaurants, cafes, activities? Angle: My friends and I love having lunch or dinner at Jack the Horse, on Hicks. Excellent food, super great atmosphere. We also like Frankie’s, Roman’s, lots of restaurants in Williamsburg, which is where my other brother, Bradley, lives. We also like just wandering around, especially in the Heights. I really like the smaller scale, compared to Manhattan, of Brooklyn neighborhoods. And I like the way you can just be meandering and discover a plaque telling you that “Walt Whitman lived here” or Hart Crane wrote “The Bridge” on the fourth floor of this apartment. It makes these landmarks feel accessible. Afterwards, I like to go to Atlantic Avenue to buy Lebanese or Turkish food for dinner. Since purchasing the apartment, I’ve become a bit of a homebody; I enjoy cooking for friends, staying in, decompressing from rehearsal and performance. Eagle: Although you dance the full repertoire, from Balanchine to Wheeldon, I’m always knocked out by your performance as one of the three sailors on shore leave in Jerome Robbins’s “Fancy Free.” On your profile page on the New York City Ballet website, you describe how one of your favorite aspects of this ballet is that, when it’s clicking, “the dancer is not aware of performing and the audience is not aware of watching a performance.” Is this only applicable to “Fancy Free” or do you also feel this way about other ballets you perform? Angle: That’s a good question. 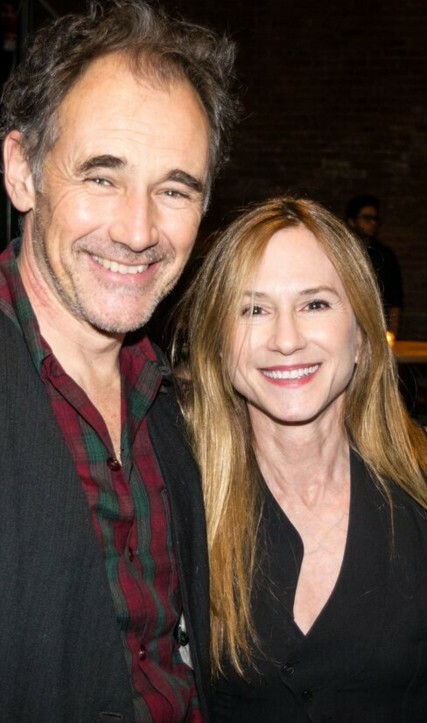 Ideally, what I always strive for is naturalism over “exhibition.” For example, I remember dancing with Wendy Whelan (it was my debut dancing with her) in the pas de deux from “Diamonds,” and experiencing that same sensation, being totally olivious of the audience. That is such a rare feeling and one that every dancer strives for. Both “Fancy Free” and Jerry’s (choreographer Jerome Robbins) “In the Night” permit that transcendence to happen. With “Fancy Free” there are many other elements at work as well. My grandfather joined the Navy when he was 17 and fought in World War II. Talking with him about his experiences informed my approach to the ballet. Also, the first time I did “Fancy Free” I was still a very young dancer working with two seasoned veterans. Now I have the great fortune to dance with my contemporaries and this heightens the sense of camaraderie and esprit de corps. The ballet is wrapped up in all these memories, so, as I said on the website, it remains very special and significant for me. Eagle: Six years ago, in an interview with Claudia LaRocco of The New York Times, you mentioned that, at your career’s end, you had no ambition to found your own company or to become a choreographer. Has your thinking changed? And have you thought about what you would like to do? Angle: My thinking hasn’t changed about not wanting to run a company or to choreograph, but I also know I don’t want to reach 35 and think “What am I going to do next?” I want to be prepared for the “next.” For the past four years, during the summer, after the company’s residency at the Saratoga Performing Arts Center, I’ve been the artistic director of the Nantucket Atheneum Dance Festival. There are lectures, dance recitals, children’s classes. We’ve attracted prominent dancers from American Ballet Theatre, the Paris Opera Ballet, the Royal Ballet, Pacific Northwest Ballet and Miami City Ballet. We don’t have a big gala or benefit; it’s all very local and low-key – we perform in the Mary Walker Auditorium at Nantucket High School. What the Festival is all about is the concentration, discipline and diligence that ballet demands. This is the kind of career path I see for myself after my professional dancing comes to an end. Watching Angle dance, exquisitely, the role of the Cavalier at last night’s performance of The Nutcracker, one hopes he puts off that decision until he’s eligible for AARP membership.